Have you looked at all the options for the hanging wire system but need something a little more permanent? This cable suspension kit includes hardware for attachment to both the floor and the ceiling. The dual-mounted configuration ensures that the display will not move, which is safer for customers in store environments. 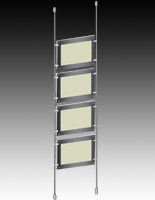 The cable suspension kit with lighting provides many advantages over conventional signage solutions. Perhaps the most helpful attribute is that the panels are able to be outfitted with entirely customized advertisements or graphics. In addition, the cable suspension kit, or wire hanging system, allows users to advertise one or numerous inserts simultaneously. Another evident advantage of the suspended signage set is that the designed-in illumination successfully grabs the attention of viewers. As a result, the cable suspension kit is being used by many retailers and advertisers prominently promote goods, services, or awareness. Each model is crafted from longstanding materials and features a space-saving layout. Check out all the cable suspension kits for sale at SignSupplies2Go.com. Save with the lowest online prices. Why are shoppers choosing LED-lit cable suspension kits over customary neon signs? 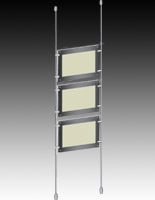 Typical fluorescent models are not nearly as slim, which can make it challenging to install them. 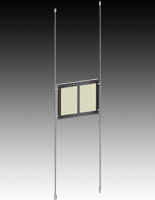 The thin design of the wire-hung system saves space, especially when placed in a storefront window. Additionally, the unique layout leaves viewers wondering how the display works. Closer examination ensures that any inserted information is quickly noticed. Focusing onlookers' attention toward your store graphics is sometimes a difficult feat, which is why these units are ideal. One of the most convenient attributes of the wire sets is the fact they accept custom retail promotions and store signs. Many times, neon fixtures have only message that is generally dictated by the fluorescent tube design. This is not the case with LED lighting panel display systems. These inventive frames can highlight graphics that are store-specific or targeted, so it is clear that they are more dynamic than the neon selections. Possibly the main reason so many customers choose this wire suspended system is that LEDs are used to supply the illumination. LED bulbs are much more energy-efficient than neon or fluorescent tubes and typical have a longer lifespan. The diminutive initial cost and the "green" design of the lighting enable users to save more money in both the short term and the long term. What are some of the features of the wire window display? Each system includes two or more lengths of wire, which connect to the floor and the ceiling. Stainless steel standoffs that have brushed silver finishes secure the top and bottom every cable, while edge gripper clamps with the same finish fasten the acrylic panels to the wire. Because the poster holders are fixed at both ends of the cable, they will be long-standing fixtures. This feature is even more helpful in high traffic locations, like department stores and technology centers, as they will not tip over like other displays. 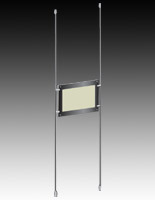 The stainless steel wire display is different from other suspended designs in that it has frameless construction. 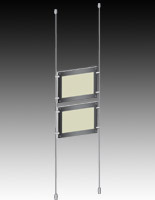 Many suspension fixtures with lighting are excessive and can be difficult to install. 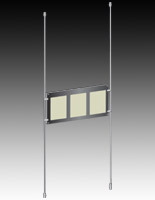 This system is very thin and each holder is actually made up of two independent acrylic panels. The surfaces are sandwiched together with four included matte colored standoff fittings. 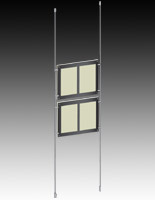 The user-friendly and lightweight paneling with wire is becoming increasingly popular with do-it-yourselfers. Furthermore, the lack of framing avoids detracting from signage because posters remain at the forefront of the display. 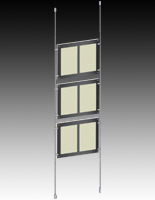 Every one of the acrylic panels used to make the system is outfitted with a black border. The color is silk-screened directly onto the clear surface. Some stainless steel rod wire frame sets come with stick-on borders that leave a bit of see-through area along the edging, but these opaque black models are finished to the edges. This specific coloration layout is the reason the soft, glowing effect is possible. 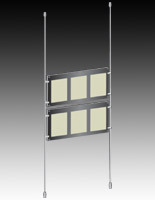 The wire display system that offers lighting has either 8-1/2" x 11" or 11" x 17" insert locations. Some of the more intricate options have as many as four frames, all measuring the same size. Other styles have the same dimensions but are formatted for landscape prints. Still, more designs come with several acrylic panels, so complete grids detailing several promotions can be developed. 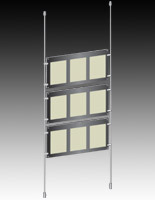 This ceiling-to-floor gripper display is frequently arranged in storefront windows, but a variety of other useful applications also exist. Retail store proprietors showcase the most recent brand names and wares. Lots of advertisers try to inform prospective customers of the available offerings before they enter. Even commercial associations promote their facilities and services, so onlookers know which resources to anticipate. More currently, corner stores, art galleries, universities, and museums have started to take advantage of the convenient features. Even some restaurants, coffee shops, and other food associations are using the stainless steel display with lighting. In these applications, a suspended system can serve as a brilliant and luminous custom menu. No matter where the stainless steel gripper display is used, it will supply an ideal means for advancing sales and profits.